Started off slow but we figured it out. 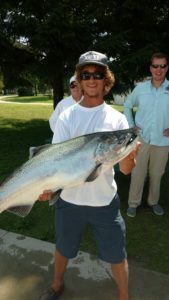 Check out that Handsome picture of our first mate Chandler with a 24 pound King Salmon. The fishing has been excellent. 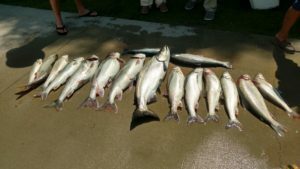 Great fighting Lake Trout today. Finished the day off with a nice mixed bag of fish including a Coho Salmon, Steelhead Trout, Chinook Salmon, and Lake Trout. All we needed today for a Grand Slam of Lake Michigan Sportfishing was a Brown Trout. Maybe we can accomplish that next year with this Great Family group that I have known for years. Thank you for coming out for some great times and excellent line pulling fun with these nice sized fish.